In our second look at how to organise a music festival, DiS goes behind the scenes with Fiona Stewart, who looks after Green Man, about the origins and development of the festival, the pitfalls of hosting such an event, and potential for growth in the future. DiS: Green Man started off as a one-day event attended by 300 people in 2003, yet has now grown into a full weekend with a capacity of 20,000. Did you envisage it growing to that extent when you first started the festival? Fiona Stewart: No. I just wanted something that could stand on its own two feet and produce something wonderful. You've still got to be able to function as an organisation to make that happen, so it's grown very organically. It's been a slow process over the whole fourteen years, and the 20,000 capacity isn't just punters. That's everyone including staff and artists as well. We haven't upped the capacity in recent years even though we've been lucky enough to sell out in advance. That's not to say we wouldn't in years to come, but I think increasing the capacity might detract from what we offer as a festival compared to the rest of the market. I think we have something that's very unique and we always strive to ensure people that visit Green Man have the greatest experience they possibly can. That also governs the direction the festival might take. Is there potential for Green Man to grow in the future without losing its identity or unique selling point? There are always opportunities for growth. It's like anything; everything has to evolve in art and culture to have any credibility. So yes, there's a lot of potential for it to grow in the future. I don't think its necessarily about how big you are but more about what kind of impact you have. And Green Man has always made a big impact in the festival market even though its not about 100,000 people. As long as we're providing, and continue to provide, an experience that appeals to everyone from ticket holders to the artists I'm happy with that. I always think of a festival as something that brings all kinds of people together. Something that creates a spark for all concerned and while that's the case there's no reason for us to be doing anything differently. What do you think it is that sets Green Man apart from its competitors in the market? I don't go to other festivals or mix in the festival world. I like to keep apart from it. All the ideas we have are ideas we come up with, and I'm very interested in anyone who can bring something to the festival. It's not about one person; it's about pooled opportunities. It's the only festival that's owned by a woman. Maybe that makes a big difference? It's not something I feel comfortable about saying because it's true, and sadly the entertainment industry is still very male dominated. I wouldn't say women are treated as second class citizens, but certainly as far as holding senior positions go, it's very male dominated. I've been treated really well within the industry but I think it's hard when there aren't any other females at that level, particularly for other females trying to get into the industry. I think if I was just starting out and needed to get support and advice from other people I wouldn't know who to approach. When I first started I tended to work in a team that worked on our own. You were one of only three UK festivals to sell out in advance this summer which is a tremendous achievement. It's certainly a relief! But seriously, I think it says a lot about the appetite for events and particularly what we're trying to do here. We're very careful about not trying to push things too far whether that be on ticket prices or the kind of acts we book. When you go into doing something like this its important to realise there's only a certain level to what you can offer. I think there's a multiple number of reasons why ticket sales haven't gone very well for some festivals this year. The weather can contribute to that, but obviously its not just the weather. I think Brexit has had a huge impact. Whether you voted to remain or leave the implications are scary, and I think it's affected people's mindsets in terms of how they spend their disposable income. I also feel there's a real appetite for what people believe to be authentic, which says a lot for the successful events this summer, and I'm very happy people associate that with Green Man. We do a lot to make that work. There are a lot of things here which are purely to do with trying to enhance the experience that are not financially driven. But then I'm also very lucky in that Green Man isn't funded by an organisation. I don't have loads of investors that need me to make a profit. I don't have a massive sponsor whose name runs through the whole festival. Is that something you might look to in the future when considering expanding the festival? I always think you should never restrict yourself in the right situation at the right time. Because that's like implying all those people are dreadful and they're not. They're just running their own businesses. From a business point of view, I think it's important to have the right kind of people with the right expectations. I saw it happen with The Big Chill years ago when they got the wrong kind of partners involved and it eventually destroyed the brand. You really have to be careful about involving partners and sponsors. We were approached two years ago by a very big company for a sponsorship deal where they had a number of ideas for the festival. They were very charming and took me out for dinner, but it was one of those uncomfortable things where you knew there was going to be a very difficult proposal coming our way at the end of it. So I said thank you for your interest but no thanks. I was very flattered that they wanted to work with us and saw us in that way, but if we'd gone with what they were offering it would no longer have been Green Man. Or not the Green Man people know. You have to consider your audience, which is critical to the ongoing success of an event like this. Green Man has a reputation for consistently booking stellar line-ups. When does the booking process begin for the following year's event? We start booking artists months and months in advance. Conversations are already taking place for next year's festival. I think you could leave it a bit later when there were less festivals around, but now we're in constant conversations with artists and their agents, inviting people down and talking to them. We try and work alongside some of the international festivals so as we're not in conflict with them. A lot of it is down to building strong relationships. We're not in a position to offer enormous amounts of money but we can offer a really great experience and the opportunity to perform in front of a musically discerning audience who are likely to love them. And also there's the brand itself. The kind of people that talk about Green Man expect a certain level of quality, not only with the line up but also from the festival itself, which is something that wouldn't necessarily have been high on many people's agendas years ago. We've had acts who've played the festival purely for those reasons. They've wanted to get in touch with that audience. Same with journalists as well. There's constant conversations here about music and I think we've attracted people that want to get involved in those. Which is great but then you can never sit on your laurels. Those festivals with the bigger organisations behind them can afford a great deal more so we have to do something that attracts people on a different level. For example, we do a lot to support up and coming artists, and the quality on the Rising stage is always very good. This year's Green Man Rising competition had 800 applicants, some of which were from as far afield as Norway and Japan. It's become a well respected competition for aspiring artists because it's not a public vote and therefore chosen by people that work in the music industry. What's more, the people involved don't charge us for their time either, and in some cases these are very senior people within the music industry. They really believe in it and that's amazing both for us and the artists that enter it too. Which reflects on the standard being so high as a result. There's another stage which is about training and mentoring people to curate music, but that comes into the other things we're doing around science, theatre, and art installations as well. It's all about bringing those other things into it and presenting new opportunities to people. Who do you see as being Green Man's main rival or competitor in the festival market? It's hard to say really. There are certain artists that we might want to book so we need to get some kind of exclusivity clause in there to make it worthwhile. End Of The Road is a very similar festival to us in terms of the musical acts they book, but I think we have a wider variety of the arts on offer to what they have. I'm one of those people that really hates the beigeness that's come into the world where you can switch on breakfast television and see a high street that looks like any other high street in Britain! From a rival point of view all the festivals are in competition, especially from the bigger ones. I don't think there is anywhere else like Green Man and that uniqueness is something I really want to keep. Do you think the festival market has become overly saturated in recent years? There's no doubt it has become saturated although when people say there are too many festivals, I don't necessarily agree with that. Quality always rises and if you've got a really good new conceptual idea for a festival, deep pockets and are prepared to put the work in, go and do it. It's like being a musician; there are literally hundreds of thousands of them but the ones with talent come up eventually, and I'd say festivals are like any other art form in that way. It often comes down to a combination of concept and just plain luck. Ultimately, music should be an inclusive thing about bringing people together; it's in our DNA. It's what people want, to be in a field listening to some incredible music in a welcoming and friendly atmosphere. We like to treat everyone the same here. There are no VIP areas. There's definitely a community spirit here unlike many other festivals. The barriers between artist and spectator don't exist in a way they do at other events. That's something I'd always set out to do with Green Man. Being involved with festivals for a long time, one of the things I've always disliked are the hierarchies that exist at certain events where backstage areas exist within other backstage areas and you need a golden wristband or whatever to enter. There are crew areas here where artists can sit away from the main festival if they choose to do so but we try and encourage them to get involved with what's going on. We actually have a lot of artists who buy tickets for Green Man if they're not playing here or anywhere else that weekend. They know the people who come here won't harass them for autographs or selfies so they can wander around and enjoy the festival like everybody else. And I think that levelling out on the base level encourages a certain kind of respect for the individual. Everything has to work at a festival all the way, and I see what we're doing as striking a balance between the heart and the ethos of the art, the music and the organisation. So for example if we had incredible music but really bad organisation it would bring down the vibe and reflect badly on the festival as a whole. Then on the other hand, we could have incredible music but also fantastic organisation which can also have a negative impact by making everything too clean and sterile. So it's about getting that balance right between every single facet. I think festivals should be a celebration of human spirit and when I hear people say they've had such a wonderful time at Green Man and they're going to take some amazing memories away with them for the rest of their lives, it really brings home just how important a festival like this can be. Is the Green Man business model - if that's the right way of putting it - based on any other specific festival or festivals? I suppose we based it on the free festivals from the early 1990s, but a nicer version where people are really nice to each other and it isn't all about money. Free festivals got a really bad reputation. I'm not saying they were all the opposite of what we're trying to do here - the really good ones were amazing even though they didn't last. I can't replicate those kind of events entirely but I'd certainly hope some of that vibe is here. Has there ever been a time where you've thought about wrapping up Green Man or working with festivals in general, and doing something different? Yes, on more than one occasion! We've had some real, horrid times, like in 2008 when we used to do our own tickets, and the merchant account for Lloyds went into liquidation. Who would've thought that could happen? So they didn't advance our ticket money which meant I had to find £400,000 in the middle of a recession. I ended up doing what everyone does in that kind of situation; I went to the banks to see if they would give us a loan which none of them did, so I remortgaged my home, and a lot of my family and friends put their money together and loaned me the rest of the money. It was a terrifying experience. I'd worked for festivals in the past that had gone under and not paid people, so I'd always vowed I would never do that myself. I rang up all the contractors who were booked in and told them I was really sorry but didn't think Green Man could happen in 200,8 even though ticket sales were fine. Anyway, they were all working at Glastonbury that June, so knew they'd get paid for that before Green Man, so they got together and said they'd use that money so they could work our festival. Which was really touching. It was a lovely moment for me. So we ran it and got through the festival, but wouldn't have done so without the generosity of others. You have to make big decisions all the time and while it looks like an amazing lifestyle to have, it can also be absolutely terrifying. What advice would you give to someone who's looking to get into the festival market? Do it. That's what I'd say to people. I haven't gone for a job interview since I was very young. I always made myself very useful, so go there and be prepared to do anything. Photocopying, answering the phone, look around the room and see what needs to be done. Fill that gap and become someone that the organisation cannot do without. That's the best way to get into it. There are lots of people that might say go on this course or go on that course, but that's the traditional way of getting into the music industry. I always try to employ people who've got a creative, entrepreneurial aspect about themselves. If someone came to me and said I've done this, set that up, and had a degree, I'd certainly give them an interview. Do a little night in your local community centre or something. Just do it. Then I'd say if you want to go to the next level, find out about all the other stuff. If you want to do a course go to your local FE college and learn about contract law. Just at entry level. Learn about presenting stuff. The basic skills, skills which can help you. The next thing once you've learned the skills of the trade and want to strike out on your own is to have a very, very good concept. Look at what's around you. See what's on the scene and make sure you're bringing in something completely different. There are lots of other factors to consider. People say it might take four years before you break even and if you're a large corporation with a six-figure sum to invest that might work, but as a small business you've really got to be looking at breaking even the first year and making a profit in the second, otherwise all you have is a hobby that you enjoy doing. There are a lot of people working in the festival industry that just do it because they love it. The festivals that seem to have prospered in recent years are the ones with a unique selling point rather than those with homogeneous line-ups that pay little attention to detail from a consumer's point of view. Would you agree with that? When people come to a festival they look at it as a kind of shopping list. What they don't realise is because of the relationships and knowledge people have, there are so many variables at work. Many new festivals were started by promoters rather than what I'd call festival organisers who were traditionally responsible for a lot of the older, more established ones. Then they'd have to buy in all their different licenses. The staging, the production company, and so on, which would cost an obscene amount of money on top of the basic costs to stage an event. Compare that with someone who has experience of organising a festival and they would negotiate most of those costs themselves. They'd know how to get their own licence, and negotiate a good deal in terms of production and security costs. If you have a bad licence for a festival your licence could go up between anything from £500,000 to £1 million. In the licence there's a list of special conditions that tell the organiser or promoter what they have to do. So for example it could be a list of specific fire regulations, or prohibiting alcohol sales beyond a certain time, and if these need to be altered for any reason the resulting costs can be astronomical. It's a much more complicated thing, especially in certain parts of the country. Some areas are more open to festivals than others, and a major part of organising an event like this is to work with the local community, whether it means offering free tickets to residents or otherwise. I think it's a shame that the festival industry is an industry. It doesn't really present itself very well. There's so much misunderstanding around government legislation on events. At the moment, Green Man is charged tax on the land we use for the festival. We're the only festival in Wales that happens to. Then there's the royalties deal with PRS, which I don't fully understand as some site deals tend to be different to other festivals. Ultimately, it should be about how much music you play not how many sponsors you have or cars parked on site. Because of things like that, the festival industry feels under siege by people who suddenly see it as a big cash cow. Meanwhile, maintaining a foothold in the festival market has become much harder. Artist costs have increased immeasurably. How do you deal with things like rising costs for artists? Is there a ceiling limit you'd pay for a headline act? You have to make a choice. Again it all comes down to building relationships. There's definitely agents we have a very good relationship with. We have to be careful because ultimately their job is to make money for the artist. I think it's a balancing act. One year an artist will be offered a slot at another festival and sometimes we can't compete financially with what's on the table. But then they also need us to be on board. People don't necessarily buy tickets for festivals unless they know all the acts, but they will buy tickets for Green Man because their expectations are high. They know the acts we book including the newer ones will all be worth seeing, and that's a very hard but comforting position to put ourselves in. Our reputation has been built around the quality of our line-up over the years so there is a bit of that. Some agents just care about money and sometimes it's just horses for courses. It's about constant negotiation where you have to show the festival's worth in other ways. Some agents understand that if you want to look after the best interests of your artist then it's beneficial for them to play an event like Green Man, if only as a way of identifying their fanbase going forwards. It's not just about them playing Green Man to a specific audience; it's also about them being written about by journalists who saw them at Green Man. Hopefully that works but then I still wouldn't take it for granted. We have very high standards and we're constantly making sure we deliver those standards year after year after year. Which acts were you most impressed with at this year's event? Kamasi Washington was amazing. Tony Njoku was really good as well, and the fact he came through the Rising competition makes me so proud. He just puts his heart and soul into everything he does. He's a very quizzical performer, which I think in the live scene is pretty rare. He's an amazing talent, and to see someone actually hold the stage like that - particularly a new artist - just highlights what kind of personality he is. We've never had such a big audience for a starter event on the main stage before. Wild Beasts were great on Thursday once they'd overcome a few technical difficulties, and King Gizzard & The Lizard Wizard too. So much energy! I enjoyed the David Bowie disco as well. That was just so much fun, really amazing. Everyone just went for it! There were so many great things this year. Also, Pete Paphides' pop quiz. I love Pete. He's one of the most knowledgeable people in the music business. He's like the Stephen Hawking of music trivia! Everyone he speaks about he has such admiration for. Even people you're not quite sure about. There've been times where I've given people a second look because Pete's bigged them up. I could go on and on. Laura Marling - yes! Belle & Sebastian - yes! There is an awful lot of music here and no one could go through it all. People get cross over the clashes between stages but to me, that's the sign of a great festival when there's so many acts you really want to see. We try to organize the program as best we can. We know there are firm favourites everyone wants to see. But then Green Man is the sum of many parts and the musical aspect is just one of them. 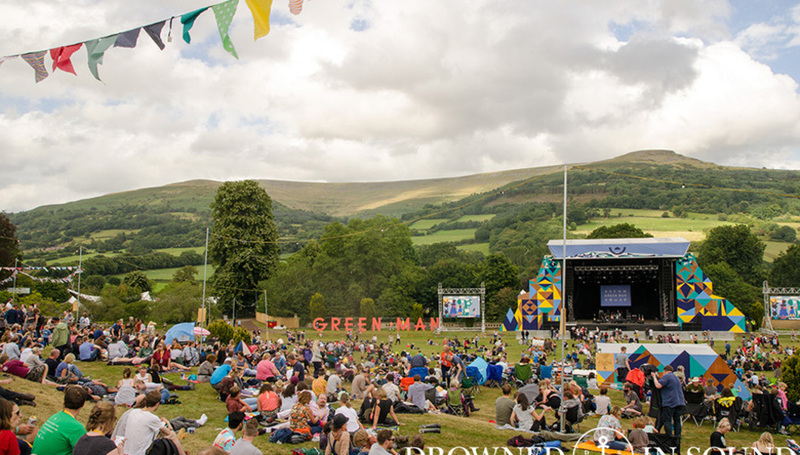 For more information on Green Man visit their official website.